I'd like to say I'm not one of those people who fear being alone. Most of my life, I've lived alone and enjoyed the freedom of being alone. No one to answer to or explain myself to if I went home late or if I worked late at night. And yes, I'm living alone here in the Metro. But I've never tried solo travel (except some day-tour trips) yet, not the kind where I would have to stay in a hotel at least for a night. Thanks to my current job, I'm forced to stay in a hotel solo so now I am ready to do solo trips...I think, haha! 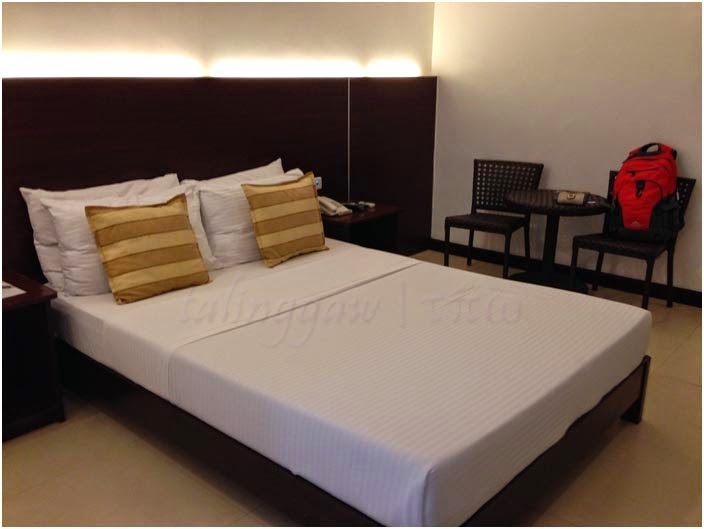 But first thing first, let me share to you my first ever solo hotel stay experience at Alba Uno Hotel as well as my take on the hotel's room and services. 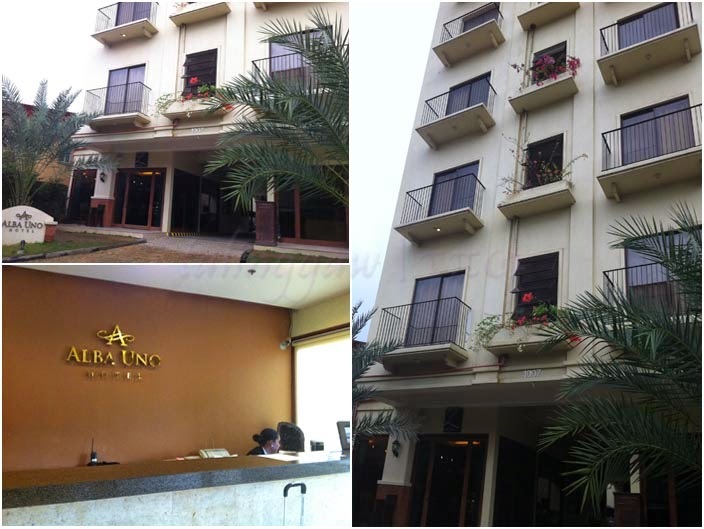 Alba Uno Hotel is a budget hotel located in Apas, Cebu City, a few blocks away (around 10 minutes leisurely walk) from Cebu City IT Park where commercial establishments and business offices (our Cebu office, too) are located. It offers room and services that I guess cater to travelers with business dealings in Cebu City, probably due to its proximity to Cebu's business district. But it doesn't mean it's not recommended for holiday travelers, too. Of course, it is; especially to those who travel on a budget. For my stay, I was booked in an air-conditioned standard room (for 1,500 PhP/night) with hot and cold shower, double-sized bed, LCD TV (with cable TV programming) and a telephone. It also comes with two complimentary bottled water, slippers and toiletries (shampoo/conditioner, bar soap, dental kits). It also has free WiFi, for those who need to get connected online. But what caught my attention in this room is its power outlet. The outlet has two USB ports where you can charge your gadgets directly. No need to worry about bringing in or looking for a power plug adaptor. Cool, right?! 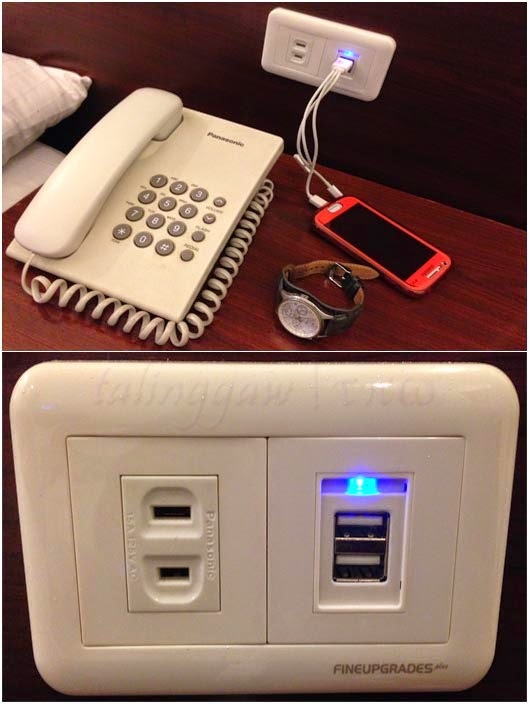 For a budget hotel it looks nice, and the usb port, nice touch. It was only recently that I got to try staying in a hotel alone and it was indeed fun, but I've yet to try traveling solo. Like you I have no problem being alone though, I'm quite used to it actually. That's a good choice of Hotel. I notice the usb port, that's cool. haha! Anyway, have you try in this hotel http://www.summithotels.ph/hotels/summit-circle-cebu/? Near ba sya sa mga tourist spots?